Château Mouton-Rothschild's 2018 has a long, long life ahead. 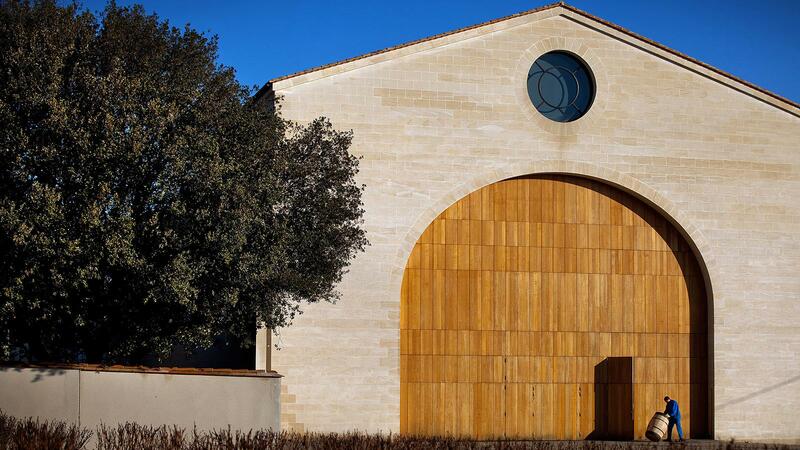 At Château Lynch Bages in Pauillac (which I affectionately refer to as "Lunch Bags"), Jean-Charles Cazes has been watching his new winery being built, slowly. Well, technically, it's on schedule for completion in time for the 2019 harvest, but it feels like it's taking forever. "There are three things you'd like to be able to control in this: quality, cost and time," Cazes says. "I've got the first two, so I shouldn't complain." On my last visit here, there was a big hole in the ground, with just a foundation poured. Now the structure is fully formed and the inside is being put together. It's enormous in size yet light in feel, thanks to the natural light that streams through the sides and roof (with UV-protective glass to help keep the temperature inside stable). It's going to be an impressive addition to the rather modest skyline of the hamlet of Bages where the Cazes family has made its home. As for 2018, Cazes is happy with everything but the reduced yields, which were a slightly skinny 2.7 tons per acre at Lynch Bages and a decent 3.1 tons per acre at Haut-Batailley. "Phenolic ripeness is very good. Alcohol is a bit wow—we don't lack for concentration. But the maturation was never blocked, so everything was in balance with phenolics, alcohol and acidity. It's all just dialed up in volume," he says. The 2016-to-2018 comparison holds true here too, as it has through the first two days of my visits in the region. The 2018 Ormes de Pez is a sneaky good value, bristling with fresh violet and cassis notes allied to a chalky spine that should age well. The recently acquired Haut-Batailley keeps to its slightly old-school feels, with a dusty hint along the edges of its black currant core, backed by persistent cedar and tobacco echoes on the finish, but it feels slightly updated from previous vintages, with a bit more vibrancy to its fruit. The big boy here, the 2018 Lynch Bages Pauillac, is similar to Pichon Lalande in its dead-straight "Pauillac-ness" and overall intensity. Tightly drawn at first check, it's laden with pure cassis and plum fruit, pierced by a long iron note and carried by very, very long waves of tannins. There's integration and balance despite its strident grip, and this is going to rival its 2016 counterpart as well. While the 1855 Classification is a wee bit off when it comes to Lynch Bages' ranking, it is spot on at Château Lafite Rothschild. Eric Kohler has settled in at the winemaking helm here, and 2018 was enough of a replay of '16 that he was ready for it. "The vintage was very strange," he says to open. "Complex at the start, classic at the end, from extreme to extreme. It's an extreme '16 even as that vintage was wet in June. But '18 was constantly wet from the start, all the way through June. The moisture wasn't heavy, but it was always wet, so the mildew pressure was extreme. Hail storms in late May didn't reach us up here, so that was good. Then from mid-July it changed to hot and dry, another extreme. The hydric stress built slowly, but there was never really a maturity blockage, especially on the plateau, where there is a bit of clay and lots of old vines. It was the second-hottest vintage since '03, but a light rain, [not quite half an inch] on Sept. 1, gave the vines what they needed. And from there it was absolutely perfect. I don't remember such an easy harvest." Kohler also notes that while 2016 finished warm and dry, the September rain fell in the middle of the month, whereas it came at the beginning of September in 2018. That two-week difference produced a bit more hydric stress in '16, while '18 wound up sailing through smoothly. The result is two similar vintages, but a more obvious tannic profile in '16, and a more polished, racy feel in '18. The 2018 Duhart-Milon Rothschild is two-thirds Cabernet and one-third Merlot, the latter giving it a generous feel and plump 14.2 percent alcohol. It stays focused in feel, though, with juicy currant fruit laced with tobacco and savory hints finishing with a tarry echo. The 2018 Carruades, the second wine of Lafite, isn't shy either at 13.9 percent alcohol (38 percent Merlot kicking in with 56.5 percent Cabernet Sauvignon and 5.5 Cab Franc). Currant, bitter cherry and licorice root notes are fleshy, while savory hints peek through on the finish, along with a flash of cast iron. The 2018 Lafite Rothschild Pauillac grand vin is 13.45 percent alcohol, a bit lofty for Cab-dominated blends in the upper Médoc, but it wears it well, as the wine is layered and focused with a well-structured beam of cassis, black cherry and bitter plum fruit all inlaid with charcoal, tar, singed juniper and tobacco notes. It's very, very, very long. Neighboring Mouton-Rothschild is always a wonderful contrast in style: Lafite and its northern tilt yield a different mouthfeel compared with that of the southern-tilted vineyard of Mouton, which results in a more overt fruit profile. Director Philippe Dhalluin has once again set a high bar with the portfolio here, starting with the 2018 d'Armailhac which captures the fresh, racy cassis and plum profile of the 2018s so far, backed by subtle mineral and incense hints on the stylish finish. "The mildew pressure was strong here, of course, but our yields were more impacted by coulure on the Cabernet Sauvignon, and then the drought at the end. It was less severe in Clerc Milon, which has more clay (it checked in at 3.2 tons per acre), d'Armailhac was OK (2.5 tons per acre), and Mouton was our smallest crop in a while (2.1 tons per acre)." "In the vats, the cake (the portion of the grape stems and skins that floats and sticks together) was 50 percent of the volume, because the berries were so small and there was so little juice. So we had to be careful of the extraction to avoid big tannins, so we lowered the temperatures a bit," says Dhalluin of the one notable tweak in the 2018's vinification. The 2018 Clerc Milon is juicy but compact right now, with good inner freshness waiting to emerge. The cassis core is laced with singed cedar and vanilla and backed by a fine, chalky minerality on the finish. It's sneaky long and should once again be one of the top values (and I must say, this is all too often overlooked as a blue-chip, ageable Pauillac). The 2018 Le Petit Mouton hits 14 percent alcohol for the first time, and there's clear power here, especially for a second wine. But it's also graceful, with polished plum and cassis notes, and a very refined feel through the finish. The 2018 Mouton-Rothschild Pauillac grand vin is 13.8 percent alcohol, even with a vast majority of Cabernet in the blend (86 percent, with 12 percent Merlot and 2 Cab Franc). I adored the display of fruit and seamless density of the 2016 here, and the '18 will be giving that a serious run for its money. The 2018 has a massive well of fruit in reserve, with alluring tobacco and alder notes gliding through. It's very, very pure, and seems as if it, too, will cruise very slowly through life, as it will likely be among the most long-lived wines of the vintage.